CMRP Walking Festival Fills Up!. Over 60% of walking spaces are now booked full. The 3 day festival begins on Saturday 26th May. Click for more info & book today! Clyde Muirshiel’s first ever walking festival, taking place in Scotland’s largest Regional Park on 26-28 May 2018 is filling up fast. 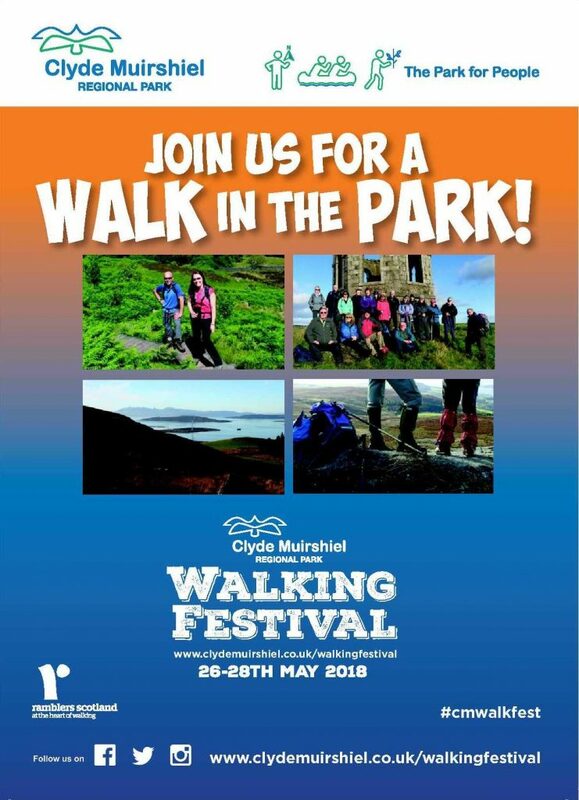 With the weather definitely improving event organisers hope that a few more people will be inspired to sign up and ‘Join us for a Walk in the Park’ with the friendly walk leaders and their helpers. Some walks are already fully booked with waiting lists now in operation. Easy two hour walks that still have availability include ‘Fantastic Finnock’ on Sunday 27th and ‘Parkhill Wander’ on Monday 28th. Moderate walks are about 4hours in length, those with some availability include ‘Discover Ducal Moor’ on Saturday 26th, ‘The Greenock Cut’ on Sunday 27th and ‘The Semple Trail’ on Monday 28th. Strenuous full day walks that still have availability include ‘The Kelly Cut & Leapmoor Forest’ on Saturday 26th, ‘Irish Law’ in North Ayrshire on Sunday 27th, and ‘The 7 Hills of Inverclyde’ also on Sunday 27th. Full details of the walks on offer and how to book your free place can be found on the Regional Park website at www.clydemuirshiel.co.uk/walkingfestival. They all begin from various locations around Clyde Muirshiel Regional Park, many start at or near a train station on the line from Glasgow Central, allowing easy access for visitors and locals alike to use public transport.